Last night Coldplay played in Forum. The support was Goldfrapp - and what a treat! My sister just resently introduced me to Goldfrapp, it is really cool pop music - check them out! I had expected that Coldplay would have played songs from their third album primarily. But it turned out that it was a big mix of all their albums, and that was very positive as I am not that keen on X&Y. It is funny though how one could have the opinion about Coldplay that it is fairly quiet music. But when you see them live it is very different. I am not sure how they do it, but it really really rocks live. I saw them last time they were here in Valby Hallen. And that was a super concert as well, actually it was so amazing that I got carried away and was singing along so much I lost my voice for three days. When they played on the Roskilde Festival it was really good too, but I think I prefer to listen to them to a normal concert. It was my first concert in Forum of some strange reason. It was a nice place, just the right size. But what was up with the beer prices? Oi Forum - shame on you! So last night we went to hear Figurines on Loppen. It was brilliant! I am really not surprised that the band got their latest record out in the US, Canada, Japan, and the rest of Scandinavia. They have created a unique style, and it rocks for sure. The singer, Christian Hjelm, have such a fragile voice and still not at all. It doesn’t brake at any point, it so powerfull in a fragile way, can you say that? I don’t know if it makes sense, but I do know, that he sings right into my heart. The music and the band gets a really good party going and we had a fantastic evening. Thanks! It was a lovely Wednesday in Copenhagen, I was getting all exited about the evening’s concert; an intimate (2000 tix) concert with White Stripes and Raveonettes in an old train repair hall or something. And I had very good reasons to be exited, cause the arrangement was brilliant! But not very easy to explain. First there was a waming up band. We didn’t know the band, and we didn’t see the band. I guess it was ok, we didn’t pay much attention to them. Secondly Raveonettes went on. This was my 10th concert with that band within 2½ years. But I have to admit - it was very poor. Sune and Sharin seemed like they were very much stoned out of their brains, which is not very apropriate. I cannot be bothered to say a lot about that part of the evening! But White Stripes were fantastic! Bloody hell it was an amazing experience. I don’t think I had any expectations to their show, but I was ever so surprised about how good their music and stage show is. It was bit like the fact about the bumble bee. In theory it cannot fly, but it does, and no one can explain it. 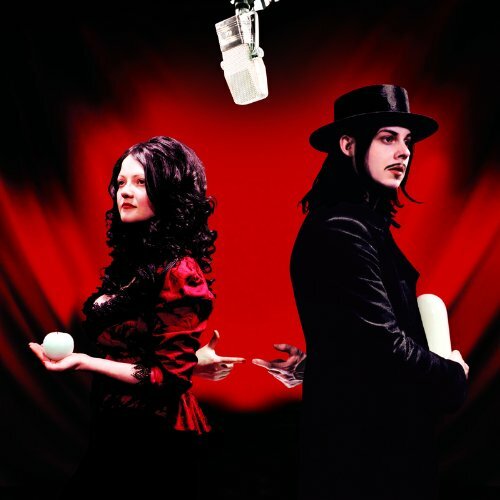 The same about White Stripes - two people on stage delivering such a well performed concert. How do they do it? I don’t know, but they really do! Never heard anything like it! On top of that Jack was all over the stage, singing (and what a voice! ), playing the guitar, piano, and what ever the other instrument was called. Singing his lungs out. He looks wierd, but it was fantastic! Meg has a very goth look to her, and still very reserved. But when she starts playing the drums I have to admit I reconcidered if I have chosen the right career. Should I have been a drummer instead? I guess not, cause I have nothing close to the coolness that she has. I tell you it was so cool, she was so cool! Why isn’t there more girls playing the drum? If they could be as cool as Meg, I am sure the world would be a better place to be. That was amazing! We had a cool evening in spite of Sune and Sharins druged out performance. …and Malene, Bering, and Morten, thanks for a fun evening. Last night it was time for a concert with LOC. I have been talking to a friend about what LOC stands for, and we came up with many interesting names. Never the less I found out last night from my friend Malene, that it stands for Liam O’Connor. And I must admit that Mr. O’Connor can deliver the goods! It was a really good concert, one cool party throughout the about hour and a half he was on. I don’t know that much of his music, and I am sure I better not think about the lyrics too much either, because I would probably be insulted. But he can get a party going, and that was what I hoped for. The stage show was totally OK, they were just having fun. No stupid comments or wannabe nonsense. It was a brilliant concert - we had a lot of fun! You are currently browsing the Taxonomy of Thorendal weblog archives for October, 2005.